Yesterday’s signals were not triggered, as none of the key levels were reached within the specified time. Go short following a bearish price action reversal upon the next touch of 0.9896. Go long following a bullish price action reversal upon the next touch of 0.9823. I wrote yesterday that the best that could be said was that we are in a consolidation above 0.9900, but I had no useful directional bias. It is always difficult to forecast short-term price movements in this pair. I was wrong, the price stopped consolidating above 0.9900 and broke below that level, although in recent hours it has come back to approach this price area again from behind. It is likely that the former support level at 0.9896 has flipped to become new resistance, so there may be an opportunity for a short trade there is there is a bearish rejection. It is interesting that at a time where stock markets have fallen sharply, and the U.S. Dollar has fallen as well, the Swiss Franc (traditionally a safe have) has advanced so little. 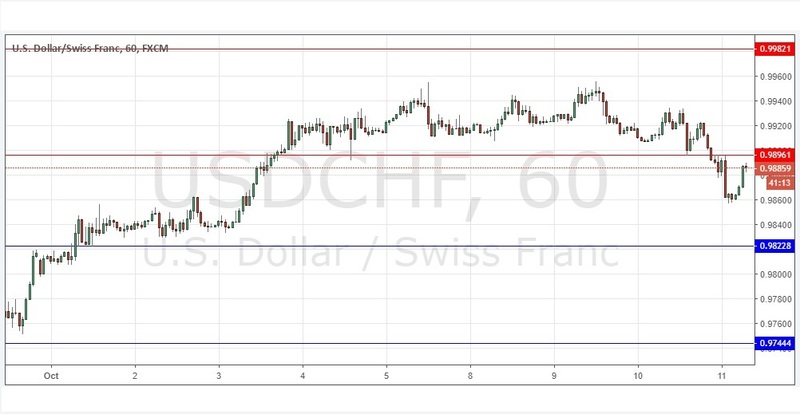 This suggests that there is not likely to be a great benefit in being long of the Swiss Franc, so it may be best to trade other currency pairs at present where there looks like being more movement and opportunity. There is nothing important due today concerning the CHF. Regarding the USD, there will be a release of CPI data at 1:30pm London time.